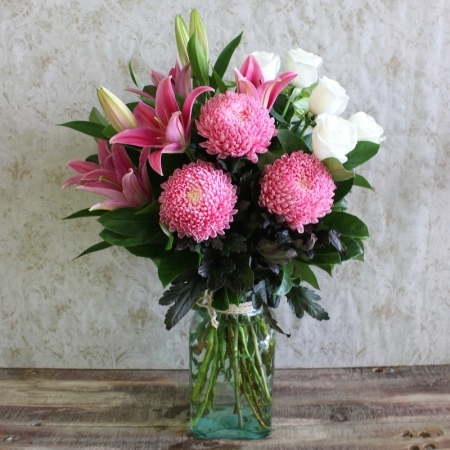 This charming grouped bouquet is made up of fresh pink oriental lilies,marshmallow disbuds and premium white roses. Delivered in this gorgeous recycled vase, this striking arrangement is sure to impress and will enhance any home or office. Recycled glass makes for a thicker,sturdy base which sets off this stunning bouquet. Order by 2:00pm and receive same day delivery.